Recently, I found myself in a unique position, sitting across from a creatively driven and passionate artist, telling me her story. As I sat there, coffee in hand, all I could do was listen. There was nothing for me to say, as it would pale in comparison to the charisma and excitement of her art and her inner drive. 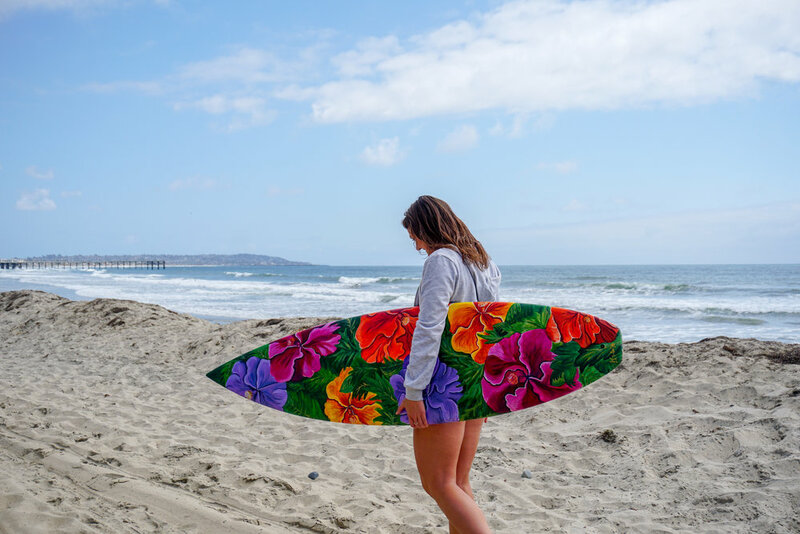 Laura Gordon is more than just a local San Diego artist. She is a growing visionary and is enhancing and spreading the idea of repurposing and reusing the things that are considered old or garbage and transforming them into works of art. Laura’s story is one that is similar to other creative greats out there. Much like Jack Johnson, who was on his way to becoming a professional surfer and then injured his leg, leading him to really focus on the guitar, Laura was a soccer player who also got injured and through encouragement of a friend, turned her small passion of drawing and painting into a large part of who she wanted to become. But what sets her apart isn’t just her style, but rather her medium and her canvas. 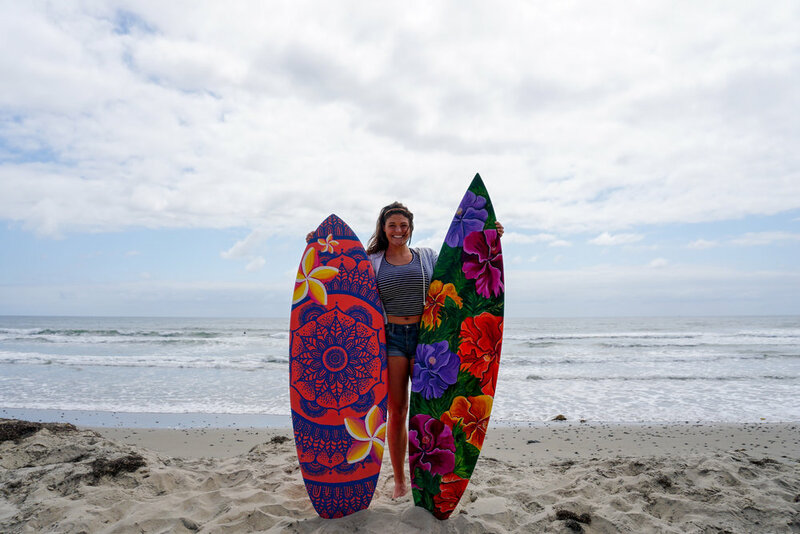 Laura paints intricate designs, like the mandala, inspired by her love for the ocean, flowers and her trips to Bali, on surfboards to repurpose them for amazing art installations. Her passion has always been deep-rooted, but the ocean brought it out in her and was multiplied by her trips to Bali. “Bali is a huge part of who I am and plays a large part in my artistic style. It changed me as a human being. While I was there, I saw trash everywhere. It broke my heart. I fell in love with the culture and the deeper meanings. I got a mandala tattoo to remind myself there is beauty in the simple things. A mandala is just made up of a lot of little lines. So to me, it's amazing that a lot of little things can come together to make one big beautiful picture.” Laura is a living representation of everything she believes in. Her actions in helping clean the ocean and her simple steps towards the goals she creates have the potential to make a truly large impact. It was on her second trip back to Bali where her roots deepened and she began understanding the true issue of the trash problem. In her trip, she made it to Ubud, where the most artistic and preserved roots in Bali are located. She met a man in the rice fields with an art shop, and agreed to teach her to paint realism and shading for 2 straight days, 13 hours a day. This dedication to her craft is a beautiful reminder of her passion and how her art goes beyond a purchase or display. Laura is a true inspiration and a creative to us at Scrimshaw and we encourage everyone to follow her journey. She is bound for greatness and we can't wait to see her change the world, one simple brush stroke at a time. You can reach her at Gordon.v.laura@gmail.com or follow her at lauragordon_!